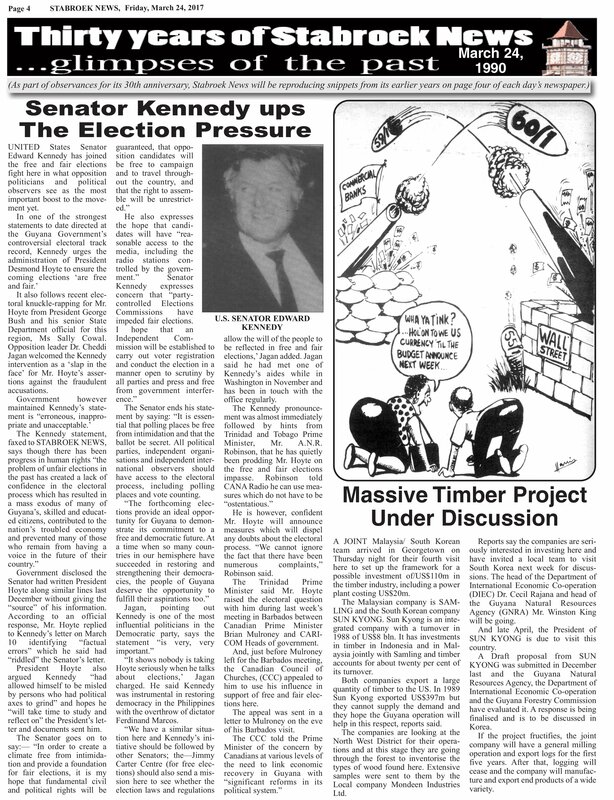 UNITED States Senator Edward Ken­nedy has joined the free and fair elections fight here in what opposition politicians and political observers see as the most important boost to the movement yet. It also follows recent electoral knuckle-rapping for Mr. Hoyte from President George Bush and his senior State Department official for this region, Ms Sally Cowal. Opposition leader Dr. Cheddi Jagan welcomed the Kennedy intervention as a ‘slap in the face’ for Mr. Hoyte’s asser­tions against the fraudulent accusations. Government disclosed the Senator had writ­ten President Hoyte along similar lines last Dec­ember without giving the “source” of his infor­mation. According to an official response, Mr. Hoyte replied to Kennedy’s letter on March 10 identifying “factual errors” which he said had “riddled” the Senator’s letter. President Hoyte also argued Kennedy “had allowed himself to be misled by persons who had political axes to grind” and hopes he “will take time to study and reflect on” the President’s letter and documents sent him. The Senator ends his statement by saying: “It is essential that polling places be free from intimi­dation and that the ballot be secret. All political parties, independent organisations and indepen­dent international observers should have access to the electoral process, including polling places and vote counting. “It shows nobody is taking Hoyte seriously when he talks about elections,’ Jagan charged. He said Kennedy was instrumental in restoring democracy in the Philippines with the overthrow of dictator Ferdinand Marcos. “We have a similar situation here and Kennedy’s initiative should be followed by other Senators; the—Jimmy Carter Centre (for free elections) should also send a mission here to see whether the election laws and regulations allow the will of the people to be reflected in free and fair elec­tions,’ Jagan added. Jagan said he had met one of Kennedy’s aides while in Washington in November and has been in touch with the office regularly. He is however, confident Mr. Hoyte will an­nounce measures which will dispel any doubts about the electoral process. “We cannot ignore the fact that there have been numerous com­plaints,” Robinson said. The Trinidad Prime Minister said Mr. Hoyte raised the electoral question with him during last week’s meeting in Barbados between Canadian Prime Minister Brian Mulroney and CARICOM Heads of government. And, just before Mulroney left for the Bar­bados meeting, the Canadian Council of Churches, (CCC) appealed to him to use his influence in sup­port of free and fair elections here. The appeal was sent in a letter to Mulroney on the eve of his Barbados visit. A JOINT Malaysia/ South Korean team ar­rived in Georgetown on Thursday night for their fourth visit here to set up the frame­work for a possible in­vestment of/US$110m in the timber industry, including a power plant costing US$20m. The Malaysian com­pany is SAMLING and the South Korean com­pany SUN KYONG. Sun Kyong is an inte­grated company with a turnover in 1988 of US$8 bln. It has in­vestments in timber in Indonesia and in Mal­aysia jointly with Samling and timber accounts for about twenty per cent of its turnover. Both companies ex­port a large quantity of timber to the US. In 1989 Sun Kyong exported US$397m but they cannot supply the demand and they hope the Guyana operation will help in this re­spect, reports said. The companies are looking at the North West District for their operations and at this stage they are going through the forest to inventorise the types of wood found here. 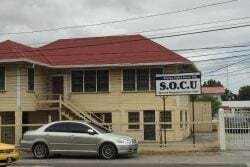 Extensive samples were sent to them by the Local company Mondeen Industries Ltd.
Reports say the com­panies are seriously in­terested in investing here and have invited a local team to visit South Korea next week for discussions. The head of the Department of International Economic Co-operation (DIEC) Dr. Cecil Rajana and head of the Guyana Natural Re­sources Agency (GNRA) Mr. Winston King will be going. And late April, the President of SUN KYONG is due to visit this country. A Draft proposal from SUN KYONG was sub­mitted in December last and the Guyana Nat­ural Resources Agency, the Department of In­ternational Economic Co-operation and the Guyana Forestry Commission have evaluated it. A response is being finalised and is to be discussed in Korea. If the project fructifies, the joint company will have a general milling operation and export logs for the first five years. After that, logging will cease and the company will manufacture and ex­port end products of a wide variety.